Kia ora and haere mai, welcome to the first instalment of 9mm for 2019, and the 208th overall edition of our long-running author interview series. Today I'm very pleased to welcome American author Sam Eastland to Crime Watch. He is the author of the Inspector Pekkala mystery series which takes readers deep into Stalinist Russia. Pekkala is a fascinating character - the top detective under the Tsar's regime, he's sent the gulags following the Communist revolution, only to then be shoulder-tapped by Stalin's regime to use his skills once more. Walking a tightrope and trying to remain an honourable man within a corrupt regime, Pekkala takes readers on quite the journey throughout the series, blending mystery and history and plenty of thrills. You can read my review of SIBERIAN RED, the third in the series, here. 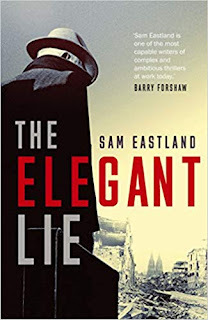 After seven tales in that series, Eastland has now released a standalone spy novel set against the aftermath of the Second World War, THE ELEGANT LIE. In the new novel Nathan Carter, a disgraced American Army officer, is recruited by the CIA to infiltrate and destroy a black market operation in post-war Cologne that the CIA fears could become compromised by the growing threat of Stalin's KGB. But Carter discovers something even more dangerous, and becomes caught in the middle while facing the danger that his cover could be blown as he tries to prevent something that could ignite another war. Sam Eastland is the pseudonym of history teacher and novelist Paul Watkins, who was born in the United Kingdom but went to Yale University and has spent three decades living in the United States. He lives with his family in New Jersey, and wrote eleven books under his own name (nine fiction, two non-fiction) before switching to crime and thrillers with his first Inspector Pekkala book, EYE OF THE RED TSAR in 2010. For his earlier work he was shortlisted for the John Llewellyn Rhys Prize in 1992 and 1996, and won the Winifred Holtby Prize for Regional Novel of the Year in 1996. But for now, 'Sam Eastland' becomes the latest crime writer to stare down the barrel of 9mm. I don’t read a lot of detective fiction, or any fiction for that matter. I spend hours at my desk every day writing the stuff and I find that the last thing I can do at the end of the day is curl up with a novel. Writing fiction gives you a kind of unwanted x-ray vision, in which you can glimpse the inner workings of a plot more clearly than you would want in order to achieve that all-important suspension of disbelief. When watching detective shows on television, which doesn’t have the same effect on me as reading about them, my children have forbidden me to say how the story will turn out, which I have an annoying habit of doing. My first recurring detective hero was actually on a television show back in the 1970’s. It was called ‘Kolchak, The Night Stalker’, and the lead character was played by Darren McGavin. Kolchak was an investigator of paranormal activity, laying the groundwork for the X-Files, which was a direct descendant of Kolchak. I found it utterly terrifying and irresistible. Many years later, I showed a few episodes to my kids and they were not impressed. Some stories do not travel well through time, and I think Kolchak is one of them, but I still remember fondly how it felt to cower in my chair, eyes glued to the screen, when it was broadcast every week. I had to do so much reading for school that I seldom turned to books during the holidays. The first time I made an exception, at least the first time it had a lasting effect on me, was when I picked up Cormac McCarthy’s BLOOD MERIDIAN. It remains for me the most ruthlessly told, the most beautifully evocative and the most finely crafted story of its kind that I have ever read. I came to crime writing after many years of literary fiction and travel writing, which I did under my real name, Paul Watkins. I have published a dozen books under the Paul Watkins name, including STAND BEFORE YOUR GOD, THE FORGER and IN THE BLUE LIGHT OF AFRICAN DREAMS, most of which have been done by Faber & Faber in the UK and by Random House, Houghton Mifflin, or Picador in the US. Using the Eastland pseudonym has allowed me to keep separate those two hemispheres of my career which, although they both belong to the same discipline, are nevertheless very different in the demands they place upon you, and in the head space you inhabit when you are writing. During the academic year, I teach history at a small boarding school Peddie, which is in New Jersey. I have been teaching for 30 years now, a fact which astonishes me when I think about it, but I never grow tired of the work. It has a way of endlessly renewing the sense of purpose I feel when I am lecturing. It also makes for a very good balance of the world outside and the world inside my head. If I didn’t have the teaching, I would spend altogether too much time with people I had invented, and not enough with people who are real. That is not always a bad thing, I hasten to add, but it is not sustainable in the long run. For the rest of the year, I live in a small village in northern Maine, where I spent my days hiking in the woods and canoeing out across the lakes. If I think of the village in Maine as my home, where tourists come to stay at old and beautiful lodges in the summertime, to hunt for bear and moose during the autumn, and to ice fish and snowmobile during the winter, the thing that only the locals do is to forage in the woods for raspberries, strawberries, blueberries, and asparagus, as well as chanterelle and morel mushrooms. Tourists don’t know where to look, or even that some of these things can be found, and the locals aren’t about to tell them. People are very protective of the places where they go to forage, but the extraordinary abundance of these delicacies ensures that most people, if they put some effort into it, can lay claim to their own little patch of the forest. I think it would have to be some kind of Frankenstein melding of Paul Giamatti and Edward Norton. In the crime writing department, I find that the stories are so interlinked by the main characters that they exist in my mind as a continuum, rather than the individual stories into which they are broken for publication. Under my own name, I wrote a book about being sent away to school, which is titled STAND BEFORE YOUR GOD, of which I am sentimentally fond. There is also a book called CALM AT SUNSET, CALM AT DAWN, which is a fictional account of the years I spent working on deep sea fishing boats off the coast of New England when I was at university. I flip through that sometimes and I still like what I see. I had my first book published at the age of 24. It is called NIGHT OVER DAY OVER NIGHT and was put out by Knopf in the US and by Hutchinson in the UK. My initial reaction was to think – whatever else happens to me in my life, no one can take this accomplishment away from me. It was a feeling that, for the first time, I had done something permanent. It was also a feeling that that I had, at last, something to stack against the self-doubt which is a part of every writer’s pantheon of demons. By then, I had been writing for a number of years. I had papered the wall of my study with rejection slips from small fiction magazines. I wrote each day with a kind of stubborn helplessness. People tell you to quit. People tell you to get a real job. People smirk at you behind your back for your presumption at thinking you might actually survive as a writer. Those are the same people who, when you finally get published, tell you that they knew all along you could do it. You have to care what people think, but you cannot care too much. I was in a shop in New York City that specializes in crime fiction. I was there before the shop opened, signing copies of a new Inspector Pekkala book. It is a strange feeling to sign a book with a name that is not your own, but I signed the name Sam Eastland so many times that I can do a better job of it than with my real name. Towards the end of the signing, the book shop owner asked if he could contact me directly if they needed me to come in a sign more stock. My publicist, who had come with me, nodded yes. I reached into my wallet for one of my cards and had it in my hand before I realized it had the wrong name, Paul Watkins instead of Sam Eastland. At that time, I was still forbidden to disclose who I really was, so I quickly put away the card and muttered something about it being the wrong one. It was an awkward moment and, when I left the shop, my publicist asked me for one of my cards. When I asked her why, she said – Because that can never happen again. One week later, I received a stack of business cards with the same font, but with the name Sam Eastland instead of Paul Watkins. They were even in a different colour, to avoid any future mistakes. I still carry both cards with me when I travel. Thank you 'Sam'. We appreciate you chatting to Crime Watch.